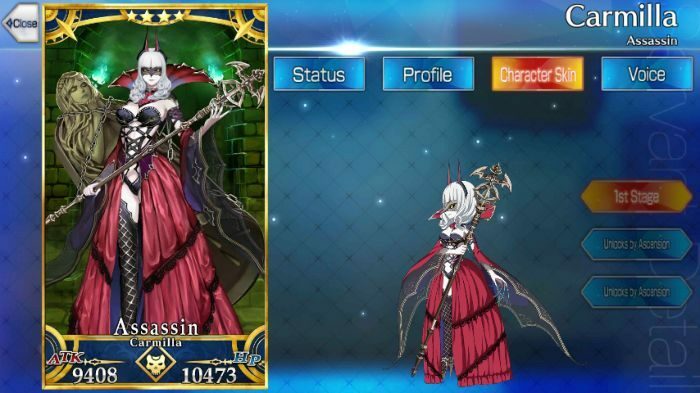 This article contains the skills, stats, strategy, and ability of Carmilla of the Assassin class from Fate Grand Order [FGO]. If you want to see the true form of Carmilla, click here. Carmilla excels in taking down single targets and dealing critical hits. However, she struggles against big crowds of enemies and needs proper support to handle them. Her Noble Phantasm, Phantom Maiden, has multiple useful effects. Not only does it do significant damage to one enemy, especially female Servants, it also heals her HP and buffs her ATK afterward. Thus, she benefits a lot from NP Gain in any way, be it from Craft Essences or allies. Zhuge Liang can support Carmilla very well, with his ability to charge NP, buff ATK and DEF, and increase critical damage. William Shakespeare performs a similar function, on top of being much easier to obtain. With King’s Troupe, Shakespeare can charge the NP Gauge by 20%, while also increasing her critical star generation. This works very well with Carmilla’s 3 Quick Cards. Players can also focus instead on using Quick Command Chains to gather a lot of Critical Stars are increase her crit rates substantially. Critical hits have the added benefits of dealing more damage, increasing Critical Star generation, and NP gain. For a hyper offensive team, Lancelot can be used with Carmilla to make full use of the Critical Star generation. Lancelot’s Infinite Military Training boosts C. Star Gather Rate, while Reverse Flow of Mana increases his Critical Damage. Carmilla’s Iron Maiden is single-target, while Lancelot’s Knight of Honor can hit all enemies, so the two can cover for each other. However, this kind of team will be prone to taking heavy damage, so a good defensive support Servant would be useful for the third slot, such as Jeanne d’Arc or Mash Kyrielight. EMIYA is a more well-rounded teammate, boasting various active skills, such as Hawkeye, which boosts his Critical Damage, allowing him to make full use of Carmilla’s C. Star generation. Clairvoyance allows him to contribute to the C. Star generation. Meanwhile, having 3 Arts Command Cards also lets the pair trigger Arts Command Chains easier, letting Carmilla charge her NP better. Carmilla’s equipped Craft Essence can be used to cover what her party cannot, and bolster their strengths even more. It’s best to focus on either NP Generation or Damage, or Critical Star Generation or Damage. Kaleidoscope is one of the best starting NP Craft Essences there is, with 80-100% NP Gauge charged at the start of the battle. The Imaginary Element offers a slightly weaker, but more common alternative. Divine Banquet boosts NP Generation by 25-30%, while Heaven’s Feel boosts her NP Damage by 40-50%. For Quick and Crit-based teams, Gem Magecraft: Antumbra, boosts Critical damage by 25-30%. Vampirism C – 8 Chance to lower 1 enemy’s NP gauge by 1. Torture Technique A 3 7 Lowers the Def of 1 enemy. Blood Bath A 3 8 Lowers target’s Critical Chance. Receive critical stars each turn. Deals significant damage to a single (Female) enemy. Increases own attack by 20% for 3 turns. (Will activate after dealing damage). Deals extra damage against Females. Draped in darkness, Carmilla is Elizabeth Bathory’s codename once she attains maturity. She represents her inner desire for bloodlust. Although stemming from the same person, the two run counter to the other. For Carmilla, she cannot accept Elizabeth since the latter is a representation of the pleasures of ignorance in her youthful days. Considering the Holy Grail, Carmilla desires to obtain the fountain of youth, which will create the path for her to occupy a seat in the political realm.